The billionaire, who owns the Chelsea football club, resigned from his post as chairman of the Chukotka legislature. Billionaire Roman Abramovich has stepped down as the chairman of the legislature of the remote Russian region of Chukotka in order to comply with the new law that bans Russian officials from owning foreign securities and bank accounts. The regional Duma accepted Abramovich’s resignation on Tuesday, the legislature’s press service reported. The press statement adds that the billionaire’s departure from politics was caused by his desire to fully comply with Russian legislation. The law, known as the nationalization of elites act, came into force on May 19 this year and forced civil servants to get rid of foreign securities and bank accounts within three months or leave their posts. The limitation also applies to the officials’ spouses and under age children. After his departure Abramovich expressed his full support to the incumbent governor of the region Roman Kopin and his intent to run again at the forthcoming gubernatorial election. The businessman also promised to continue organizing major business projects in Chukotka. Chukotka Autonomous Region lies in the extreme Far East and north and the region’s economy is relatively weak as mining for resources in the harsh conditions and the high transport costs rarely make it feasible. After becoming Regional MP in 1999 Abramovich registered his oil trading firms in the region and the taxes from their huge turnover supported the Chukotka economy. It continued after Abramovich became Chukotka governor in late 2000 and after his resignation in 2008 secured his election as a regional MP and as the speaker of the Chukotka regional Duma. 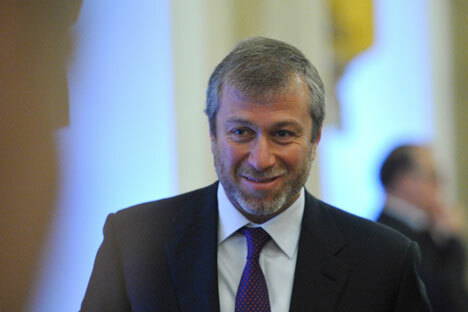 Roman Abramovich used to be Russia’s richest man and is still high in the billionaires’ ratings. This year Russian Forbes magazine put Abramovich in 13th place in its list of Russia’s richest people with over $10 billion of assets. Abramovich is also known as the owner of the British football club Chelsea which he bought in 2003 and in which he invested an estimated on $1.61 billion, securing the club three Premier League titles.